I'VE BEEN MAKING news rounds with handheld mobile phones for several years and I'm so happy that my Sony Ericsson Xperia Arc makes easy work of recording video clips of books, newsprint and standard subjects. I continuously look at ways of improving this process and currently I record a video clip with my Xperia Arc while simultaneously recording the audio file on an iPod Touch. 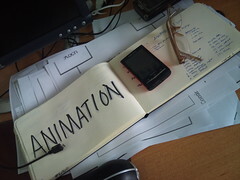 When I stop recording, the Xperia Arc sends its file up to Google Plus where I can move it around by using Picasa Web services. The audio file automatically goes to Audioboo.fm where it's given a piece of cover art (shown) as it sends a public tweet. (I'm @topgold on both services.) I plan to integrate this kind of user-generated content into four years of the creative multimedia curriculum I teach for the Limerick Institute of Technology. It's important to note that none of my handheld work requires a desktop or laptop computer. 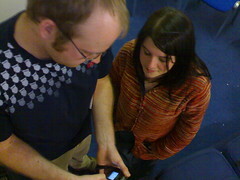 The Android phone and the iPod Touch can produce all the media. This is one-pass processing. I turn on the devices, start talking, and the material uploads in the background. For posterity's sake, I hyperlink to the files with a blog post a few hours later. You can see today's Sunday news round on YouTube. 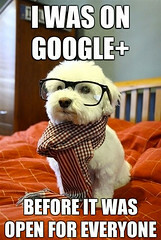 AFTER ONE MONTH inside Google Plus, I know I can recommend its use for our creative multimedia students in LIT-Clonmel. In fact, I'm already using Google Plus from http://gplus.to/topgold to connect with one of our students who is spending the summer with her parents in India. And I hope to put Google Plus Hangouts to good work while working with friends five time zones away as we plan a high school reunion. People who are comfortable with their Facebook friends or who enjoy the tearaway chatter of Twitter may lack both the time and inclination to jump into another corner of the internet. However, anyone who uses Gmail, Google Search, Picasa or YouTube may discover Google Plus is part of a social layer next to them already. And those with the next generation of Android phones may discover G+ is baked into the baseband, making Google Plus the fastest social networking software on the handsets. There are some practical steps I'm going to try during the fall semester in hopes of linking quality pedagogy to a high-quality mobile learning experience. I SPEND PART OF EVERY SUMMER thinking about ways I might nurture creative thought in the classroom. Like Chris Horn, I believe the main value of Irish third level education is the development of analytical skills. Chris cites "the skill to diagnose, identify patterns, and apply previous experiences" alongside "the capability to articulate, explain and motivate." Developing this core skills means getting the correct measure of teaching laid down alongside a proper amount of mentorship. And in that regard, mentorship can succeed only when laced with respect. Therein lies the first challenge for me--earning and holding respect. I'm going after that major deliverable by creating quality course material for the 2011/12 academic year (photo evidence provided). OPEN COFFEE FRIEND and creative entrepreneut Colm Lyon, CEO of Realex Payments, continues stepping up in the business world. He won the prestigious Ruban d’Honneur in Round Two of the European Business Awards. To progress to the next level, Colm needs a new suit (his analysis) for the next level of competition in September. Realex Payments was one of ten country representatives chosen from Ireland to attend the first stage of the event, Unicarepharmacy and Aerogen have also been awarded a Ruban d’Honneur, selected from Irish representatives at this years event. I FEEL REALLY bad for the small local newspapers because I am caught in a vortex of e-ink devoid of Tipperary accents. I carry at least 10 unread ebooks with me everywhere. Nestled into that collection are two newspaper subscriptions with content I read and share with Twitter every day. I also share annotations from the books, from course notes, from campus Acrobat files, and from edited correspndence. The e-book industry is my daughter's game and it is running on a fast-paced pitch. The Kindle (pictured) is driving some of this success. But the Nook and the iPad also play their parts. For the first time in 11 years teaching first year students how to slot into a Media Writing world, I can confidently set down a practical assessment that culminates in an e-ink product. Readers of my blog will see the results as early as October 2011 and will be able to be among the first thousand who buy a group product for less than five dollars a pop. Proceeds will benefit the Pen & Pixel Exhibition in May 2012. Robert Andrews -- "Penguin sees 14 Percent of Sales from e-books" on PaidContent.org, July 29, 2011. Sent mail2blog using O2-Ireland Typepad service on my Nokia E7 from the Riverhouse Cafe, Cahir, County Tipperary, Ireland. THERE ARE MANY REASONS why the Kindle is a helpful tool for learning. One of its handy facets is the Daily Review, an Amazon tool that helps me review and remember the most significant ideas from my books. Based on a flashcard format, the Daily Review shows me flashcards with either my highlights and notes or the Popular Highlights from one of my books. I have to have marked books as "read" before they show up in the review section. Then, Daily Review takes my through all of my read books, one per day. This is going to help me improve my academic delivery because as everyone know, periodic review of ideas makes it easier to remember them. FIVE YEARS AGO, I blogged about ways to jump directly to a specific spot in a YouTube video. Some of the syntax has changed but the fundamantals are the same (i.e., think hashtagging t=xmxxs). 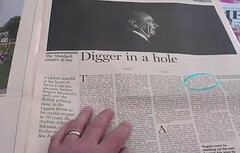 So to go directly to me discussing "Digger in a Hole" during a Sunday news segment that I recorded on my Sony Ericsson Xperia Arc (at left), just use http://www.youtube.com/watch?v=7DLevhg6Wng#t=3m41s and you're in without any fuss. Or just click the screenshot in this blog post. The technique has been around for at least five years. The same code may also be used when you are embedding a YouTube video into your web pages. By adding the #t parameter to a YouTube video URL in the embed code, your viewers will enjoy a segment that buffers and plays from exactly that hashed point. This is an elegant way for people to skip intros and flat segments of a video. And if you produce "videos" that are actually movie clips made from audio files, you can bookmark and share via shortened links the exact segments when someone is talking about something very relevant to a topic. Previously -- "Google Video Finds Frames" on my blog, July 21, 2006. WHILE HOME FOR MOST of the summer, I have discovered our three-year-old prefers to watch videos on the "Big Dora Phone" (the nomenclature earned by the iPad) rather than using the kludgy 32-inch television set in the sitting room. Mia's personal viewing habits (seen at left) could be an economical step because they suggest that when she's out on her own, she won't need a television antenna and could escape the annual TV License Fee. Fortunately for the Irish Exchequer, TV won't die off during the lifetime of the next generation. However, the way people view TV segments has changed already. I suspect that the RTE Player is serving as many views of popular shows during the week following initial broadcast as the shows get in live viewership. According to research by Magnet Networks, 71% of Irish people now watch TV programmes on their portable mobile devices and desktop computers, with one in five doing so regularly. This figure rises dramatically to 89% for those aged 18-25, with 58% regularly watching TV on their computers. In Mia's case, her preferred gateway to Ben and Holly, Charlie and Lola, Peppa Pig and Dora the Explorer is through the touchscreen that she can carry from room to room. In a perfect world, her personal viewing preference also works while underway in Ireland. That is proving to be more of a challenge. Digital Times -- "Rapid Changes in TV Viewing Habits" on the blog, May 11, 2011. I'M ALWAYS LOOKING for rugged technology and think the Sony Ericsson Xperia Active will set the bar above any other mobile phone I've used. 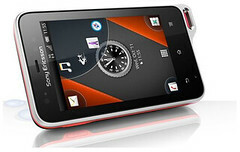 It's powered by Android 2.3 on a 1 GHz processor, has a three-inch touchscreen display and offers greater water, dust and scratch-resistance than any multimedia device I have owned. It snaps 5 Mp images--good quality but way below the superb Xperia Arc's optics. Its on-board memory (512MB RAM, 320MB internal memory and expendable memory support micro SD card slot) is fine for what I do with a phone but people with 100 apps in their lives could encounter the "force-close" message on account of the system memory of the Xperia Active. I have several Sony accesories so the Xperia Active's DLNA, proper Bluetooth (not the neutered Apple version) and industry-standard 3.5 mm jack will let me use all that kit for another five years. Watch on http://youtu.be/2a0KEBx33qY or look at the specs. I SPEND MINUTES EVERY DAY during the summer reviewing snaps I've taken of creative work recorded during the 10 years I've taught in Tipperary Institute. It's easy to see creativity in bloom as shots of former students flow by in slideshows. I think we should be doing more to hook up with past graduates, perhaps sharing snippets of the curriculum they conquered by showcasing current work from practical sessions and by offering a flow of lectures that might help upskill graduates on the job. My Media Writing module has evolved a lot since 2001 and now features snippets from films, audio segments from radio shows, and a challenging foray into semiotics. Some of our social media module would fit directly into the jobs that many of our graduates hold. It's just a matter of packaging the material for a select audience and then getting feedback from that group to improve our classroom presentation.